Master goldsmith Charles Lewton-Brain trained, studied and worked in Germany, Canada and the United States to learn the skills he uses. His work is concerned with Process and Beauty as well as function. He thinks of decision making in metal as drawing, working with the same sensibilities of mark and commitment as when working with pen and ink. Many pieces use a 'printmaking' approach to working metal, that is that the work is done in separate steps in groups and layers building towards the finished piece. Process and the tensions between nature and structure are part of his concerns. His work and writing on the results of his technical research have been published internationally. In 1994 Brain Press was established which documents, publishes and markets the results of his research activities. He has worked on the Cage Series of work extensively since 2001. Images of some Cage work is here Slide Show. He traveled to Thailand to visit Dr. Hanuman Aspler, his colleague, in the spring of 2008. This journey contributed to a major exhibition and catalog (River Trip) and rekindled his interest in chasing. Over 700 images from the journey are here. He also published two major books in 2008, Foldforming with Brynmorgen Press, and The Jeweler's Bench Book with MJSA Press. He spent January 2015 in Chiang Mai, Thailand studying chasers. Since 2012 he has co-juried the Lewton-Brain Foldforming Competition, an international online exhibition organized by the Center for Metal Arts and Sue Lacy. A distinguished Fellow of the Society of North American Goldsmiths, a member of the Royal Canadian Academy and a Fellow of the Gemmological Association of Great Britain he has lectured and taught in England, Germany, the United States, Canada and Australia. He is a consultant on the jewelry field, and has written expert witness reports regarding health and safety in US legal cases. A short video interview showing foldforming is here. A 2010 online interview with Jay Whaley is here an hour long interview. He developed 'fold-forming', a series of techniques new to the metalsmithing field which allow rapid development of three dimensional surfaces and structures using simple equipment. The Rolex Awards for Enterprise chose a project of his on the further development of fold forming for inclusion in a book on innovative developments in science and invention in the world, the Rolex Awards for Enterprise 1991 Edition. He has written seven books, over 15 monographs and published hundreds of articles in magazines as well as book chapters. He translated the monumental 560 page German Theory and Practice of Goldsmithing into English. He was on the editorial masthead at MJSA magazine, and has been a contributing editor on a number of books to MJSA Press. He served as a director on the board of the Alberta Crafts Council for five years and six years as the National Crafts Representative on the board of the Canadian Conference of the Arts, where he had national reporting responsibilities and presented the views of Canadas national crafts organization, the Canadian Crafts Federation of which he was a founding participant. After a year as Vice-President he served over two years as President of the Canadian Crafts Federation/Federation Canadienne des Metiers dArt. Charles was an essential member of the Craftyear 2007 Project which resulted in over 550 events nationally. He created Alberta's Black Rod for the Legislative Assembly, a major piece of state silversmithing. Similarly he has made maces, chalices and repaired important awards: click here for more. 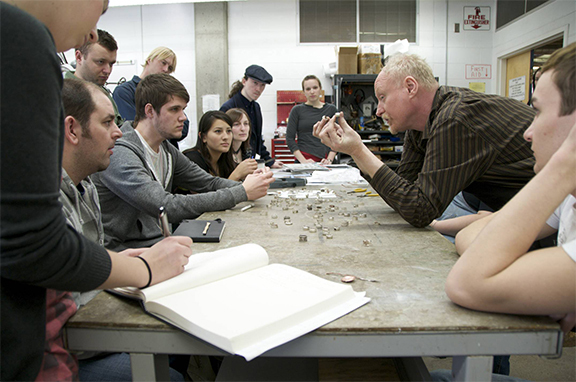 He has lived in Calgary since 1986 and served for 19 years as Head of the Jewellery/Metals Program at the Alberta College of Art and Design and teaches full time, writing articles, exhibiting, consulting and making work. In 1996 he began a web site collaboration with Dr. Hanuman Aspler in Thailand. The Ganoksin Project web site is now the largest educational site in the world for jewelers with over 4 million unique visitors a year who linger for an average of 20 pages and a 12,500 member archived, searchable discussion email list called Orchid. His writing started the site. From 1991-2002 he and his former spouse, artist Dee Fontans created and ran the Centre for Jewellery Studies in downtown Calgary. His two daughters Erika Kulnys-Brain and Aniko Lewton-Brain are successful, lovely, intelligent young women. To order Erika Kulnys' 2005 CD "Hurricane" Email Us. His brother Peter Lewton-Brain is a renowned ballet dancer, movement specialist founder of ADMR and osteopath, with his partner, Etoile, former Principal Dancer (Etoile) at the Ballet Rousse and now head of a ballet school, Paola Cantolupo and their figure skater son Davidé. 1980 ZDF, Certificate in German Language Skills: Goethe Institut, West Germany. French (working knowledge, read well). 1980-15 Fine Craft Artist, independent educator, author, lecturer, publisher. 1996-11 Served on provincial and national craft, arts and culture boards. President of the Canadian Craft Federation 2004-2007. Led Craftyear 2007 project and allied IV conference in Calgary. CCA national Craft Representative six years. Five years on the board of the Alberta Crafts Council. Served on a number of NASO committees. 1980-15 Invention and original development of Fold-forming; a group of sheet metal working techniques new to the field characterized by great rapidity and complexity of cross section. Research is ongoing to the present. Original research and dissemination of compositional systems in metal, gold painting, patination, metallurgy, production. 1996-15 Co-Founder, Partner and Co-developer of the Ganoksin Project web site, worlds largest free educational web site for the jewellery field. 1994-15 President of Brain Press Ltd, publishing, consulting and education. 1979-15 Over 300 workshops, lectures presented across Canada, USA, Australia, England, Portugal. Presented as a visiting artist or conference speaker. Examples of subjects addressed included: Lewton-Brain’s Work, FoldForming, the Ganoksin Project, The Jeweler’s Bench, Future of Craft, PR and Professionalism, Keynote addresses, Business practices, Small Object Photography, Gold Applications, Surface treatments, Safety in the Studio, Chasing and Repousse, Patination, Stonesetting, Construction and hinges, metallurgy, production systems, wax work and casting, ancient metalworking technology. 2012 Saidye Bronfman Governor General’s Award for Fine Craft. 2007 Canada Council for the Arts Project Grant for Cage Series development. 1997, 98, 02 ACAD Student Association ‘Teachers’ Cup’ for “having the most positive influence on students education at the college”. Rolex Awards for Enterprise 1990 recognition for Fold-Forming. 1986 Society of North American Goldsmiths Research Grant for research into gold applications technology and history. Over 85 one-person exhibitions nationally and internationally. Over 420 group exhibitions nationally and internationally1975-2015, including the National Gallery, Ottawa, Canada. 2012, 13, 14, 15 Judge, Lewton-Brain Foldforming Competition. 2012 Judge, Saul Bell Design Awards, Albuquerque, NM. Juror, Johnson Matthey Sustainable Design Platinum competition (International). Judge, MJSA 2010 Innovation Awards. 2012-06 Judge, MJSA 2010 Innovation Awards. Judge, Johnson Matthey Sustainable Design international competition. 2009 Juror Calgary Glass Initiative regional exhibition. 2012-08 Judge, Western Showcase, Calgary Stampede, painting. 2006-03 Judge, World Champion Blacksmith's Competition, Calgary Stampede. 2005 Juror, Saul Bell Awards, Albuquerque, NM. Award Ceremonies in Las Vegas. Judge, Jewelry Arts Awards, international, Lapidary Journal. 1998-1989 Canadian curator, juror and national coordinator for “Handwerk 96”, Munich, Germany. 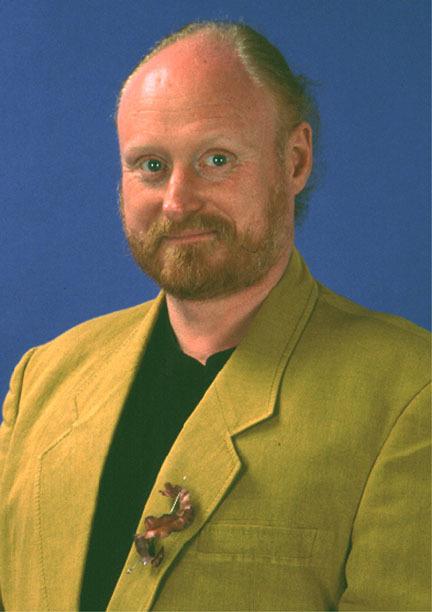 2004-07 President of the Canadian Craft Federation/Féderation Canadienne des Métiers d'Arts. 2005-08 Founding member of the Innovation Council on policy for the industry and strategies to improve North American skills in jewelry design and manufacturing. New York City. 2001-07 Founding member of the Board of CJM, the Coalition for Jewelry Makers (six industry partners, MJSA Industry group, SNAG (Art Jewelers group, Rio Grande Co (sponsor and suppliers), Bench Media (professional goldsmith group) and the Ganoksin Project (internet community and voice). Author of 9 books, many monographs, over 280 articles in magazines and journals nationally and internationally, and over a thousand pages of writing online. 2015-1996 Co-founded and worked on a collaborative public service web site with Dr. Hanuman Aspler, based in Bangkok, Thailand. Ganoksin.com, the largest information website for jewellery in the world. Over 800 pages of my writing there, 500,000 pages of information, several hundred videos, 4 million unique visitors a year, a 12,000 member email news group that gives edited messages a day. 2014 Completed phase one of the Archive Book Project, 40 carefully selected and collected antique technical books, scanned, OCR’d as searchable, interactive pdfs and each was reviewed in a 700-1,200 word essay. These are online, and disseminated at the Ganoksin Project. Professional Artist since 1981. Winner of the 2012 Saiye Bronfman Governor Generals Award for Fine Craft, Canada's most important national award for Craft. Exhibited and published widely with national and international recognition for his contributions as an artist, educator and cultural sector worker. Visiting Artist at numerous colleges in Canada, the United States and Australia, and speaker at conferences in Canada and the United States, England, Australia, Portugal. In 1984 was granted Distinguished Membership status from the Society of North American Goldsmiths and Juried Membership Status in the Nova Scotia Designer Crafts Council, Halifax. In 1999 the Alberta College of Art and Design awarded him the "Board of Governors Award of Excellence", "in recognition of significant contributions to the arts in the province of Alberta". In 1997 and 2001 he won the Student Association's "Teachers Cup" for outstanding teaching and inspirational work for students. Important contributions to historical development: Maintained a strong practice and exhibition record since 1981. Published images of work and opinions widely. Writing subjects ranged from critical to technical, from PR methods and photography for artists to studio safety and research papers on historical and technical subjects. Personal artistic research into process and compositional systems is reported to the field internationally in the form of books, videos and articles. Thousands of metalsmiths internationally have adopted methods he developed and use them in their work. His inventions and working techniques are taught around the world in jewelry programs. He invented fold-forming, a large system of working sheet metals that is completely new to the world. It uses simple hand tools to produce complex three dimensional and relief forms and structures rapidly. There are hundreds of shapes possible, and the results are widely used for sculpture, installation, decorative blacksmithing and jewellery making. Numerous colleges and schools worldwide now offer courses using these techniques. The British Museum research lab (Metals Head, Paul Craddock) and the Rolex Awards for Enterprise have confirmed this is a new, original approach to working metals (1990). As an educator he has influenced many students, and directly taught his ideas about position, philosophy, learning and technique to several thousand people through workshops and lectures. Many students credit his teaching for their success in the United States and Canada. He taught at the Nova Scotia College of Art and Design from 1982-84, 86 and in Calgary since 1986 at the Alberta College of Art and Design, where he has been jewellery/metals program head for over ten years. He has given over two hundred workshops and lectures internationally. Lewton-Brain translated the 560 page book "Theorie und Praxis des Goldschmieds" by Erhard Brepohl (from German into English). A 13 year "service to the field" project (two complete editions were translated). This book is the most important, comprehensive book in the metals field (2001). He has written four books for jewelers, the last one, on safety for metal workers has become a standard resource in the field. Some eight published monographs have sold tens of thousands of copies internationally. Past President of the Canadian Crafts Federation/Fédération Canadienne des Métiers d'Art, Canadas national organization for the craft sector. He was a founding member of the group in 1999. He spent six years as a member of the Board of the Canadian Conference on the Arts (CCA) as the national representative for Craft with reporting and representational responsibilities to the eleven provincial craft councils and to the Canadian Crafts Federation. His reports (every six months) from 1996-2002 were influential in national Craft development and as references for provincial and federal bodies. He served as an Alberta Craft Council Board member1991-95. He has participated in many provincial cultural intitiatives, conferences and workshops provincially and nationally. Lewton-Brain created a major competitive commission for the Legislative Assembly of Alberta, the 'Black Rod' made of sterling silver, gold and ebony, 42" long. Only the British Parliament and Ottawa have this symbolic object. Alberta is the first other commonwealth Legislative Assembly to have one. The British Parliament, the Government of Sri Lanka and the Royal Canadian Legion were all sponsors of the project (1996-97). Other public commissions include the Mace for the Technical University of Nova Scotia in Halifax and a chalice made for the Pope's visit to Halifax in 1984. His contributions to significant contemporary practice include: Wearable art, exposed in the form of public performances, lectures and published images. Risky work, challenging audience and wearer. Contemporary jewellery shown to the public in numerous venues and disseminated through magazine and catalog images, as well as the internet. He has focused since 1997 on 'Cage' series works, related pieces bound by format, ranging from performance oriented body art to jewellery. The recent concentration has been on jewellery. The jewellery is made by welding stainless steel wire with an orthodontic fusion welder, then electroformed, literally grown in a copper-acid bath, finally heavy gold electroplating. He has served as a jury member on a number of juries, Saskatchewan Craft Council, Metal Arts Guild (national), ACAD awards committee member 1990-2001. Member of Diplome D'Honneur committee of the CCA and juror for the national Diplome d'Honneur and for the Rogers Communications Award (English) (Media Competition). Juror for the Keith Kelly Award for Cultural Leadership, and juror for the Saul Bell Awards in 2003. Canadian curator and national coordinator for "Handwerk 96", international exhibition at the Munich Handwerksmeße, Germany for nine years (1989-98). Curated 'Body Ornament West" in Calgary and Edmonton in 2004 and has curated a number of exhibitions of contemporary jewelry in North America. Technical editor and advisor for books by other authors. Editorial advisor and columnist for AJM magazine. Lewton-Brain's web published articles have touched thousands of artists and craftspeople. In concert with Dr. Hanuman Aspler, he developed the Ganoksin Project (1996-05), now the largest educational resource web site in the world for jewelers and metalsmiths. http://ganoksin.com/ Over 600 pages of his writing are published there. The Ganoksin Project has up to 2,500,000 hits a month, people linger for an average of 20 pages, some 6000-9000 unique individuals visit a day. The 5500 member mailing list 'Orchid' generates some 50 edited messages a day, all archived and searchable. The impact worldwide is huge, and the site provides access to critical, business, PR and technical information to tens of thousands who would not otherwise have it. The Ganoksin Project has created and facillitated partnerships for information sharing with over 12 international jewelry magazines and a number of trade, industry and art jewelry oganizations. A history of the Ganoksin Project is here. He maintains a list of some 400 metals, jewelry and art links which are widely circulated via email and have been published at several web sites, (SNAG, Metal Web News, Australian Jeweller). He regularly compiles and submits lists of exhibition opportunities to Canada's national metals group (MAGlist) and to the Orchid list. Influence of his research into compositional systems can be traced in the work of many people nationally and internationally. Galleries representing Charles Lewton-Brain's artwork and goldsmithing. T5J 1H4 , Canada, Tel: 780-488-6611, Fax: 1-780-488-8855, Email. Nova Scotia Designer Crafts Council Permanent Collection. His important teachers included Bob Ebendorf, Jamie Bennet, Klaus Ullrich, Walter Zeiss, Christian Gaudernak, Kurt Matzdorf, John Cogswell, Harold O'Connor, Haaken Bakken, Bill Ottermiller, George Van Duinwyck, and Orland Larson. His successful students are many, who include Jeff De Boer, Brigitte Clavette, Louise Perrone, Steve Fong, Kari Woo, Devon Clark, Shona Rae. He has taught over 2000 individuals personally through workshops. 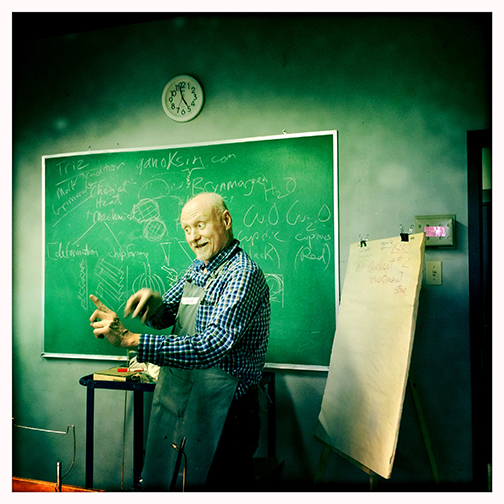 Some have national Canadian or international fame, and those who have adopted techniques he pioneered from workshops include Harold O'Connor, Cynthia Eid among others. Professional Experience 1980-12 Fine Craft Artist, independent educator, author, lecturer, publisher. 1996-10 Served on provincial and national craft, arts and culture boards. President of the Canadian Craft Federation 2004-2007. Led Craftyear 2007 project and allied IV conference in Calgary. CCA national Craft Representative six years. Five years on the board of the Alberta Crafts Council. Served on a number of NASO committees. 1980-12 Invention and original development of Fold-forming; a group of sheet metal working techniques new to the field characterized by great rapidity and complexity of cross section. Research is ongoing to the present. Original research and dissemination of compositional systems in metal, gold painting, patination, metallurgy. 1996-12 Founder, Partner and Co-developer of the Ganoksin Project web site, worlds largest free educational web site for the jewellery field. 1994-12 President of Brain Press Ltd, publishing and education. 1979-12 Over 270 workshops, lectures presented across Canada, USA, Australia, England, Portugal. Presented as a visiting artist or conference speaker. Examples of subjects addressed included: Lewton-Brain’s Work, Fold-Forming, the Ganoksin Project, The Jeweler’s Bench, Future of Craft, PR and Professionalism, Keynote addresses, Business practices, Small Object Photography, Gold Applications, Surface treatments, Safety in the Studio, Chasing and Repousse, Patination, Stonesetting, Construction and hinges, metallurgy, production systems, wax work and casting, ancient metalworking technology. 2012 Awarded the national Saidye Bronfman Governor General’s Award. 2011 Inducted into the Royal Canadian Academy. Nominated for the Canada Council for the Arts Molson Prizes, Alberta Crafts Council. 1998 Nominated for Bronfman Award for Crafts by Canadian Crafts Museum, Vancouver, BC. 1976 Haystack Mountain School of Crafts Student Assistantship. Linda Richman Gallery, Milwaukee, WI. 2001 'April Feature: Charles Lewton-Brain', Juried, Harbinger Gallery, Waterloo, Ontario. 2000 “Charles Lewton-Brain”, Riccardo Accurso Gallery, Sheperdstown, WV. 1997 “Charles Lewton-Brain: Work”, Inaugural exhibition, Gallery, NBCC, Fredericton. 'Charles Lewton-Brain, Graduating Exhibition, Jewellery, writings, drawings. 1977 'Devils, Deaths and Siloman Dreams', Shooting Gallery, Halifax, Nova Scotia, drawings and poetry. 'Recent Drawings', Sheridan College of Design, Mississauga, Ontario, drawings. 2011 “24th Annual Contemporary Canadian Jewellery Exhibition”, La Freniere and Pai Gallery, Ottawa, Ontario, November. “25th Anniversary Gallery Exhibition”, R. Grey Gallery, Boise, Idaho. Metal Arts Guild Exhibition in Print (juried), published Fall 2011. Alberta Foundation for the Arts Traveling exhibition “Cheong Ju selection”, Rolling Hills, Medicine Hat, elsewhere to come, in Alberta. 2010 Chased & Repoussé, Velvet Da Vinci Gallery, San Francisco, CA, March-April. “Pennsylvania Society of Goldsmiths Exhibition”, Wayne Art Center, Wayne, PA.
“Through the Lens”, INFLUX gallery, Calgary, juried. “Alberta Arts Day”, Jubilee auditorium, Calgary, Alberta Crafts Council. "Containment: A Chair Exhibition", Mendel Art Gallery, Saskatoon, Sask, traveling. 2006 "Did You Know", Mary Black Gallery, Halifax, Nova Scotia. "Parameters of Preciousness", William Gahlberg Gallery, Blen Ellyn, Illinois. "Etch", INFLUX Gallery, juried, Calgary. Seattle Metals Guild Biennial Exhibition, Seattle, Wa, juried. SOFA Chicago, "Exhibition in Print" Show, Chicago, Illinois. "Melting Point", Art Central, Calgary, Metalphoric Group. "You Wear What You Eat", Juried, Kirkland Art Center, public, Kirkland, WA, USA. "December Exhibition", La Freniere and Pai Gallery, Ottawa, Ontario. ‘Turn up the Volume', Metal Arts Guild national juried exhibition, Toronto, traveling. International Enamels Society Presenters Exhibition, Loggia Gallery, Gatlinburg, TN. “The Year of the Bear” Willock and Sax Gallery, Waterton Lakes, AB. 2000 Curator, “Filtered Senses”, Lynn Tendler Bignell Gallery, Brookfield, CT.
“December Exhibition” Lafreniere & Pai Gallery, Ottawa, ON. “Art Walk 2000” Jewels By Design Gallery, Calgary, AB. Sept.
“Celebration of Alberta’s Jewellery Artists” Mesa Silver Gallery, Calgary, AB. Nov.
“Talisman” Tlell Gallery, Haida Gwai, BC. Oct/Nov. Juried. 1999 “Silver”, Invitational Exhibition, Canadian Crafts Museum, Vancouver. “Project Empty Bowl”, Canadian Crafts Museum, Vancouver. “Fire and Iron”, CANIRON, Calgary, “Fire and Iron: Selections”, Edmonton, AB. “The End is Near: Artists Look at the Twentieth Century”, Wustum Museum, Racine, WI. "Identity/Identite", Metal Arts Guild national traveling exhibition, Montreal, Toronto, St. John's, Waterloo, Saskatoon and Edmonton. "Metalsmithing in the New Millennium", Danforth Gallery, Portland, Maine. "Dress Up! Artists Address Clothing and Self Adornment", Wustum Museum, Racine, Wisconsin, traveling. “Heritage and Diversity”, Montgomery College Art Gallery, Rockville, MD, traveling. “Double Vision”, Gallery IO, New Orleans and Wustum Museum, traveling. ‘Heritage and Diversity’, Montgomery College Art Gallery, Rockville, MD, invitational. ‘Cross Currents: a contemporary Survey’, Gatehead, England, traveled England and US. SOFA, exhibition, Miami, Florida, sponsored by Gallery IO, New Orleans. ‘Exhibition in Print’ Metalsmith, Mobilia Gallery, Cambridge, MA. ‘The Oxidation/Burial project’, group site-specific work, Boise, Idaho. “Op Art: Eyeglasses by Jewelers”, Hoffman Gallery, Portland, OR, traveled AZ, TN, CA. “Good Things Come in Small Packages”, Muttart Gallery, traveled two years Alberta. ‘From Head to Toe‘, Glenbow Museum, Calgary. “Tea with Eros”, Metal Arts Guild National Juried Touring Exhibition. ‘Leading by Example’, exhibition, McMullen Gallery, Edmonton, Alberta, May. 1993 ‘Interiors: Domestic Objects by Artists’, Triangle Gallery, Calgary, Nov-Dec 1993. “Good Things Come in Small Packages”, Muttart Gallery, traveled 2 years. 1991 “Formes et Contrastes”, invitational, Grand Prix des Métier d'Art, traveling in Quebec. 'Amphora', invitational vessel exhibition, Jocelyn Gobeil Gallery, Montreal, Quebec. 'Show of Hearts', invitational, Metal + Gallery, Winnipeg, Manitoba, Canada. 'For the Body', touring exhibition throughout Alberta for two years, invitational. 'Emerging Artists' Society of North American Goldsmiths Conference, San Antonio, TX. Opening Exhibition, Metal + Gallery, invitational, Winnipeg, Manitoba. Trax UNI4, mail art exhibition of post cards, Pordenone, Italy. '10th Regional Crafts Exhibition', Schenectady Museum, Schenectady, New York. NSDCC Permanent Collection Exhibition, Public Archives, Halifax, Nova Scotia. "Grand Prix des Metiers d'Art Quebec', Montreal, PQ, traveled to New York, 1985-1987. 'Jewellery: Jewelry', invitational, Ontario Crafts Council Gallery, Toronto, Ontario. 'Good Enough to Repeat', Letki Designs Gallery, Toronto, Canada. 'Ars Sacra', invitational, Nova Scotia School of Architecture, Halifax, Nova Scotia. 'Metal Arts Guild Exhibition 1984', Prime Gallery, Toronto, Ontario. 'Conversations', SUNY New Paltz Gallery, New Paltz, New York. 'Canadian National Juried Exhibition', Calgary, Alberta, Toronto, Ontario. Nova Scotia Designer Craftsmen Exhibition, Halifax, Nova Scotia. 2011 Judge, MJSA 2010 Innovation Awards. 20010-04 Judge, MJSA magazine Innovation Awards (Global/North American industry awards). Also charged with 'cool hunting', predicting future trends and issues. 20010-08 Judge, Western Showcase, Calgary Stampede, painting. 2004-99 Links submission reviewer and juror for the Metal Arts Guild Web Site (Ontario). 2012-09 Editorial advisory board for Studio magazine, Canada’s national craft magazine. 2012-01Editorial Advisory Board Member for American Jewelry Manufacturer (AJM) and (it’s name changed) MJSA Journal. Technical consultant and reviewer numerous of articles. 2003 Advisor, “Woven Wire Jewelry” book project by Linda Chandler and Christine Ritchey, quoted on back cover. 2002 Advisor and consultant on the book Metal Corrugation, by Patricia McAleer. 2001 Translation advisor and technical consultant for book “Moving Metal” by Adolf Steines, a book on chasing and repoussee for Blue Moon Press, New Jersey. 1994 Editorial Reviewer, Chapman and Hall publishers, New York. 1989-90 Manuscript Reviewer for 'Professional Goldsmithing' by Alan Revere for Van Nostrand Reinhold, New York. 2009-07 Past President, Canadian Crafts Federation/ Féderation Canadienne des Métiers d'Arts, attended board meetings and committees. 1997-05 Member of Diplome D’Honneur committee of the CCA and juror for the national Diplome d’Honneur and for the Rogers Communications Award: English Canada (Media Competition). Juror for the Keith Kelly Award for Cultural Leadership. Member of CCA committees. 2003-4 Vice President, Canadian Craft Federation//Féderation Canadienne des Métiers d'Arts. 2006-07 Led the Craftyear 2007 project IV conference in Calgary, chaired group that facilitated 7 exhibitions, demonstrations, and the Craft Organization Directors Association conference. 2005-08 Founding member of the Innovation Council, a consortium of North American industry and trade representatives that worked on policy for the industry and strategies to improve North American skill sets and capabilities in jewelry design and manufacturing. New York City. 2001-07 Founding member of the Board of CJM, the Coalition for Jewelry Makers (six industry partners, MJSA Industry group, SNAG (Art Jewelers group, Rio Grande Co (sponsor and suppliers), Bench Media (professional goldsmith group) and the Ganoksin Project (internet community and voice). This project was to slice through the information silos in the field sideways, spreading information and helping the individual maker. This group planned and created a successful series of ‘Clasp’ conferences, analyzed the field and looked to fill ‘holes’ in it. 2002-4 Curator, “Body Ornament West”, organized jurying, call, exhibition. Triangle Gallery in Calgary and ACC Gallery in Edmonton. Web exhibits produced. 1994-97 Director on the board of the Alberta Crafts Council. Served on number of NASO committees. 1997-2005 Maintained a list of 400 metals related websites which were emailed out upon request hundreds of times and republished on a number of public service web sites. Represented Canada at the First International Craft Fair and Conference in San Juan, Puerto Rico. Represented and reported to the Canadian Crafts Federation. 1999 Member, organizing Committee for “The Future of Canadian Craft”, a national meeting of every province’s crafts council’s representatives, the Canadian Crafts Council and myself as national CCA representative. Assisted in the resulting formation of the Canadian Crafts Federation, which replaced the CCC. Montreal. 1989-1998 Canadian curator and national coordinator for “Handwerk 96”, international craft and design exhibition at the Munich Handwerksmeße, Germany. 1996-09 Created and grew the Ganoksin Project with Dr. Hanuman Aspler. 1995-96 Albertan Coordinator for ‘Phoenix Project’, national project for a book and on the history of Contemporary Canadian Metalsmithing by Aggie Beynon. 1991-02 Created and ran the Lewton-Brain/Fontans Centre for Jewellery Studies in Calgary, this offered classes and showed experimental exhibitions. Exhibitors included Lilian Klimek, Briggite Clavette, Linda Chow, Crys Harse, Andrew Samek, Arctic jewellers, Alberta women metal artists, Dutch “Point of View” show (125 works). 1994 Instigated the first Canadian DACUM curriculum development event for jewellers held at the Southern Alberta Institute of Technology, Calgary, created proposal as a result. 1989-99 Translated the 560 page book “Theorie und Praxis des Goldschmied’s by Erhard Brepohl into English. Two separate editions were translated. A “service to the field” type of project and commitment. Writing and images reporting on the results of research into various compositional systems for metalworking has been shared a number of ways. (Fold-forming, patinas, gold applications), and service to the field (critical opinion, technical, safety, professional practices, small object photography). 2012-1996 Co-founded and worked on a collaborative public service web site with Dr. Hanuman Aspler, based in Bangkok, Thailand. Its aims are to dissolve barriers to information, to make the life of the working jeweller easier, safer and better. Global and free access are important parameters. Called the Ganoksin Project, the site has a search engine and over 700 pages of my original writing on jewellery techniques, critical essays, book reviews, PR techniques for artists, and more. This is now the most comprehensive site in the world for jeweller’s information, with over 500,000 pages, over 300 hosted blogs, dozens of informational videos and republishing agreements with 12 international magazines. There are some 4 million unique visitors a year. They visit an average of 20 pages. The Orchid discussion list, with over 8,500 professional members, produces 50 edited emails a day which are archived and searchable. All this makes our site the most active and largest in the world for the jewellery/metals field. The address is: http://www.ganoksin.com. Besides content and direction my role has been communications and business. 1998-11 Constructed, built, maintain Brain Press web site. 2011-1994 Wrote a number of books and monographs on technical, and other subjects which were published through my company, Brain Press, and with other publishers. These are available across the USA, in England, Australia and have gone to dozens of countries. 2008 Published the hardcover 220 page book “Foldforming” with Brynmorgen Press of Maine. Published the book “The Jeweler’s Bench Book” with MJSA Press of Rhode Island . Won the Silver award in the SNAP Excel Competition as second best technical book published in the Untied States in 2008. This book raises funds for the Ganoksin Project. Published the book “River Trip”, 80 page catalog of Cage Series work exhibition. 2007-08 Ported over 20 publications to Print-On-Demand (POD) from traditional manufacturing formats. Republished two videos (Small Scale Photography, and Fold-Forming) as dvd format. Published new monographs, on chasing, Keum-boo, Polishing. 2005 Led, facilitated the 'Impressions: Moving The Surface" book project of ACAD Student work. Published through Brain Press. 2000 “Theorie und Praxis des Goldschmieds”, by Erhard Brepohl published by Brynmorgen Press. 1999 Translated the 560 page book “Theorie und Praxis des Goldschmieds”, by Erhard Brepohl. 1992 Book titled “Shareware”, 120 pages. 1991 Monograph Depletion Gilding: a Historical and Technical Introduction. 1986 Patinas for Small Studios.